Harvesting the kinetic energy generated by crowds of people is one of our favorite approaches to renewable energy. 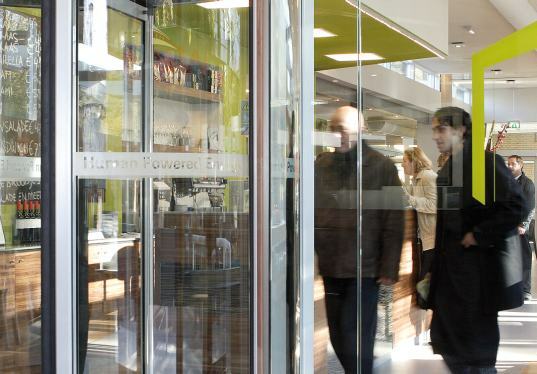 Recently Netherlands-based Natuurcafé La Port installed an energy generator in a rotating door, so every time someone walks in for a cup of coffee, they give just a little bit of their energy back to the coffee shop. We keep saying that solving the problem of global warming will require that we open up new doors in the field of renewable energy, but we must admit that we never expected to mean it literally! The door was part of the refurbishment of the Driebergen-Zeist railway station designed out by architecture firm RAU and built by Boon Edam. The door is expected to generate around 4600 kwh of energy each year, which may not sound like much – but every little bit helps. 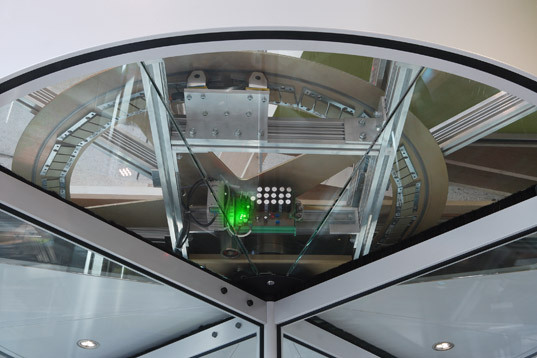 To enhance the design, the team decided to include a transparent ceiling to show how the system works, and LEDs display the amount of energy that it is generated each time someone walks in the door. The story is a little off base: the door will SAVE the store 4600Kwh energy because it is a revolving door and the exchange of heated air with the outside air is minimized. The door also features LED lights which are powered by users pushing through the door. The energy from the door is stored in super capacitors to keep the lights running. You can read the original press release here: http://www.boonedam.us/inc/press/pressdetail.asp?PressId=182. Think about it! Firstly, the more advanced countries in the world require that revolving doors have "speed controllers". These devices are usually hydraulic and they prevent the door from rotating too fast and thus becoming unsafe. So, the argument that the door would be hard to push is often not valid. Secondly, revolving doors are generally GREEN anyway. They provide an airlock which prevents the escape of heated or cooled air with or without the power generator feature. Lastly, the argument that the manufacture of the door is not GREEN is ridiculous because any other storefront type door would be equally as environmentally unfriendly to manufacture (aside from timber or a rock!) Whatever power generation benefit is produce is just good old fashioned energy! Great work Boon Edam! "Each person pays for energy...." And of course this energy is coming from the food we eat. Nothing is free. But I like this idea; it's interesting, original, and gives us something to think about. As a solution to the problem of energy, it is useless. sweedish169- don't forget while the economic price may be recouped(if the promised power is delivered) what about the damage done to the environment during the construction of this door. How long till the power saved equals the carbon footprint of the construction? I'm no whiz at the numbers but it seems to me judging by some of the other posts here that the power is substantially less than that proposed, so I would be curious to see how long it takes to gain back both the economic cost as well as environmental. I think that one of the key problems with alternative energy sources is that people expect them to provide hordes of energy. The important think about this option, and many others is that they help. If it saves energy, then it saves people money, not just the people that own the shop, but everyone that pays that utility company for energy. Each person pays for energy, if the overall use becomes less (from a little here or there) it might keep the power companies from having to build a new power plant. If they have to invest in new capital, they convey that cost to the individual consumer. So, even something small like this door helps save everyone money. It's just like you learn in primary school, every little thing counts. When we are talking alternative energy, we need to be talking alternatives. RealLifeLEED Thanks for your comment. I realized the revolving door is basically a motor generator (not a piezo floor which is astonishingly ineffective) - and used the jogging number as a average physical energy available from a human, True, a person might exert more energy for a short time, but I doubt the revolving door would be adjusted to be so "stiff", or it would violate disability guidelines. It would be astonishing if even 100KWHrs were harvested this way. Burning the garbage deposited every day in the cafe would generate more energy. gregb... I'm not sold on the 4600 kWh/year either. Your argument seems to be based on the premise that the energy generated comes from walking on the floor, but I think from the picture it's more from the people pushing through the door, which would require substantially more effort (and hence greater opportunity for power generation) than simple footfalls on pavement that joggers produce. You're wrong about your lightbulb conversion savings as well. If a 60 watt incandescent is running all day for 365 days we get: .06 kW (60 watts / 1000) * 365 * 24 = 525 kWh a year, meaning the maximum savings possible would be 525 (going from a light bulb to nothing)... 4600 kWh a year is to me quite a huge number considering the means of powering it. The typical american home uses approx 10,000 kWh/year, and a typical 1 kW solar array only produces 1400 kWh/year (in coastal southern US climate) by comparison. It would take a little more than a 3 kW solar array to handle the same load, at a cost somewhere in the neighborhood of $25,000-30,000. Say what you will about US government spending on defense, but DARPA has been looking into other piezoelectric generators for awhile too. Unfortunately, it can't generate 4600 KWHrs a year. A jogger dissipates about 100 watts of power continuously- so if they were pushing the revolving door around continuously for a YEAR without stopping, it would generate only 876 KWHrs in a year. When you take into account day/night traffic, power conversion inefficiencies, etc I doubt pedestrians will generate more than 100KWHrs a year. For perspective, if the cafe converted one incandescent bulb to LED, they would save more energy in a year than generated by the revolving door. And since LED of CFL bulbs are likely 1000x less costly than this fancy stunt, you could save 1000x more energy for the same money. If you REALLY cared about the environment, this door is a poster child for waste and inefficiency. I wonder how much it costs to install, and what the savings are. I bet the return on investment isn't less then 10 years. Great Idea! - I could see someone getting really dizzy trying to save a little extra money!